This map pack comes as both with a 19 and 33-page pdf, each with 1 page front cover, 1 page how-to-use, leaving 17 and 31 pages, respectively. We get a one-page version of the map, complete with grid and 8 pages blown-up versions of the map (including grids, of course)for use with miniatures as well as a b/w-version blown-up version of the map. We also get the 1-page overview-map on the upper-level as well as 16 pages of blown-up versions of the map, again in full-color and b/w. The lair is in itself interesting, as it is located in a cavern featuring a waterfall and features the stunning level to detail I’ve come to appreciate from Jonathan Robert’s work. Even better – poor Europeans like yours truly get the whole maps in A4-format as well. The Fantastic maps line also provides jpegs of the overview maps, with and without grids as well as full maptool-support. 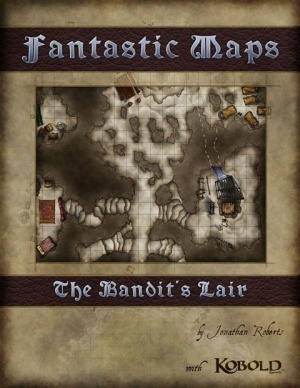 What really made my day with this installment of fantastic maps, though, was the additional isometric version of the bandit’s lair that is provided in a separate jpeg: Damn, I love it. 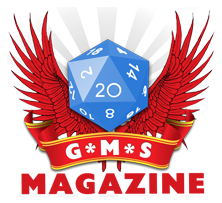 Perhaps because it conjures up some pleasant memories of grognardian days of old for me, but I love it and its inclusion proves that this already excellent line seeks to go above and beyond. The maps are stunning and bookmarked, the support is extensive and for several formats and the isometric bonus jpeg is just great. I could whine about wanting a blown-up isometric version of the map in addition to the top-down ones, but that would be criticizing for additional, awesome content. This installment went even further than other ones and thus I’ll happily, gladly give it a full 5 stars – Jonathan Roberts has once again provided an interesting location that is far cooler than the rather generic “Bandit’s Lair”-title would lead you to presume. Highly recommended!